The Home Depot Foundation is dedicated to improving the homes of U.S. military veterans through financial and volunteer resources to help nonprofit organizations. The Foundation has pledged a quarter billion dollars to veteran-related causes by 2020 and since 2011 has invested more than $160 million to ensure every veteran has a safe place to call home. 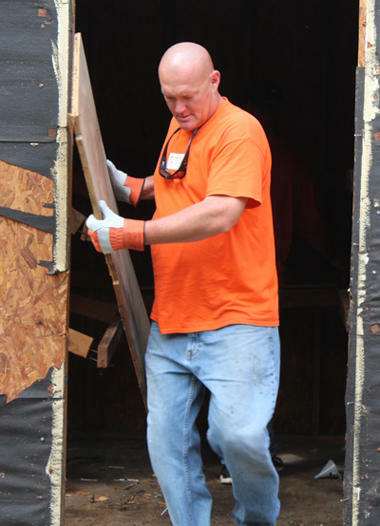 Through Team Depot, the company's associate-led volunteer program, thousands of Home Depot associates volunteer their time and talents to positively transform neighborhoods and perform basic repairs and modifications to homes and facilities serving veterans with critical housing needs. Since its formation in 2002, The Home Depot Foundation has granted more than $380 million to nonprofit organizations improving homes and lives in local communities. Since beginning its partnership with Volunteers of America in 2011, the Foundation has given nearly $11.3 million to the organization to improve housing for homeless veterans and their families. Each project includes numerous opportunities for Team Depot, The Home Depot's associate-led volunteer force, to get involved as well. Together, Volunteers of America and The Home Depot Foundation have refurbished or built housing for more than 3,000 homeless veterans and many of their family members.